Given the interest last year in our “Search for Santa” posting it seems only natural for us to also analyze the spatial dimensions of other holidays. Given the upcoming Thanksgiving break (which has resulted in a campus wiped as empty as a post-dinner sweet potato and marshmallow casserole dish) the remaining cadre of the FloatingSheep faithful turned their penetrating gaze (much like Uncle Lester when the pumpkin pies come out) to the age old question: what is the most “Thanksgivingest” place in the United States? OK, maybe we just made that question up but it makes a nice rhetorical flourish. Drawing upon Google Maps data from November 2010, we calculated the presence of the keyword “thanksgiving” in the geoweb (or cyberscape) layer of 14,000 unique points in the lower 48 states. 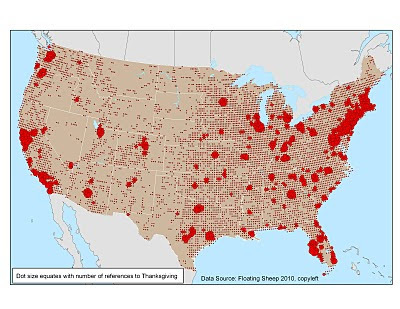 The map below illustrates the resulting spattering of thanksgivingness across the golden brown skin of the United States with large metropolitan areas representing moist succulent slices of holiday spirit; the veritable “breast meat” of Thanksgivingness. The raw score, however, is merely the appetizer of a multi-course analysis, such as standardizing for the overall size of the geoweb at each point. (Hopefully the first map has not ruined your appetite). This metric is akin to a per capita measure (e.g., income per person) except it represents Thanksgivingness per Geowebnicity. Points that scored high on this measure had a larger proportion of their spatial web activity focused on Thanksgiving (see the map below). Just as tilting your dinner plate will shift the location of cranberries, this standardized measure reconfigures the spatial visualization of Thanksgivingness. Interestingly much of the Eastern United States and large metropolitan areas drop out of this visualization. In contrast, areas such as southern Utah and northern Arizona, the central valley of California and the Cascade range in Washington and Oregon rise faster than a Butterball pop-up turkey timer. Clearly by this standardized measure the Western U.S. is Thanksgivinger than the East. Although the site of the original Thanksgiving (Plymouth, MA), Key West and the interior of Maine also seem to have gotten “their turkey on”. The final entrée of this research is a hot spot analysis (based on the Getis-Ord Gi* statistic) that looks at both the values of individual points but also the values of its neighbors. Concentrations of spots with statistically significantly high values are designated “hot” while locations with uniformly low values are “cold”. The map below highlights the contours of “hot” and “cold” concentrations (based on standardized data) for Thanksgiving. Areas without dots were not found to be statistically significant concentrations of hot or cold. 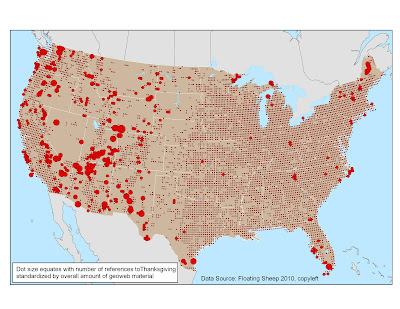 One sees hot spots (represented in shades of red) of “Thanksgiving-ness” spread like a rich (albeit seemingly randomly distributed) gravy over the landscape of the western U.S. Upon closer inspection, however, it is easy to distinguish the “wishbone of thanksgiving” expanding from its base south of El Paso, TX across New Mexico and Arizona before cleaving into twin clavicles at the apparent fulcrum point at Las Vegas, one of the few major metropolitan areas that ended up as a “hot spot”. Must be all the buffets. From Vegas, one branch of the wishbone expands eastward through northern Arizona and Utah before a splintering end at the edge of Montana and the Dakotas while the other moves up California’s central valley and along the Cascades before settling in at Seattle. A hot spot of Thanksgivingness is evident along the Big Sur coast between Monterey and San Luis Obispo where evidently people have a lot to be thankful for. The same goes for Key West and also apparently (and rather surprisingly) the interior of Maine. But with the hot also comes the cold and we need consider those areas trending more towards “Thanksgivinglessness” (represented in shades of blue). Spreading from Michigan to the gulf coast like an unappetizing mound of congealed mashed potatoes, these cold spots dominate much of the non-coastal Midwest and South. Even FloatingSheep’s headquarters in Lexington, KY seems immersed in a decided cool (verging on gelatinous) spot in distribution of Thanksgivingness per Geowebnicity. Of course this analysis is based on the level of Thanksgiving in the geoweb so interpret it with that in mind. Still it does seem that Key West, Las Vegas and the Big Sur coast demand further fieldwork on this topic. So it seems like my winter break plans are in order. And central Maine? Sounds like an excellent chance for the enhancement of graduate student education. p.s. Many thanks to Jeff Levy who generated the maps for this posting. Where in the world is the University of Kentucky?